Attending an "Old West" event and only two "food" vendors are available: Kettle corn and a food truck that just ran out of food. How do you feed hungry "Troopers" out on campaign telling the "Buffalo Soldier Story?" So we looked in a 1900 Sears, Roebuck & Company catalog and found a basic farm wagon between $31.15 and $36.90 (a great bargain). In the early 21st century absolutely impossible to obtain. The objective: build a farm wagon, a chuckbox, put them together and it becomes a chuckwagon. Researching "wagon builders" there are a few throughout the U.S., but costly. A basic wagon is 10 thousand dollars and upwards, add shipping charges and your wagon will cost 15 thousand dollars. A chance meeting with Mr. Bill Melton in 2014 at Porterville's "Pioneer Days" was the winning ticket. Melton said "I can build your group a chuckwagon." BSMCU took delivery of their chuckwagon in August 2016 and has seen service in Central and Southern California. The design is a basic farm wagon with a custom chuckbox. 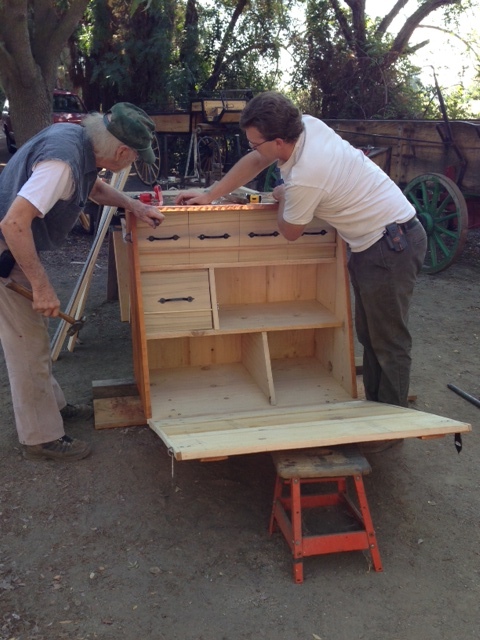 Built without a blueprint or instructions, using only nails in the chuckbox, and carriage bolts for the farm box. 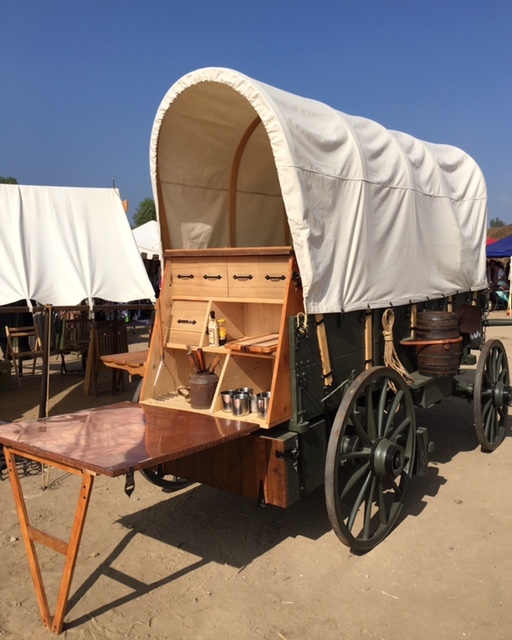 The chuckwagon was methodically and systematically handcrafted in Porterville, CA. Built with old-school quality and craftsmanship. The wagon is an absolute work of art. 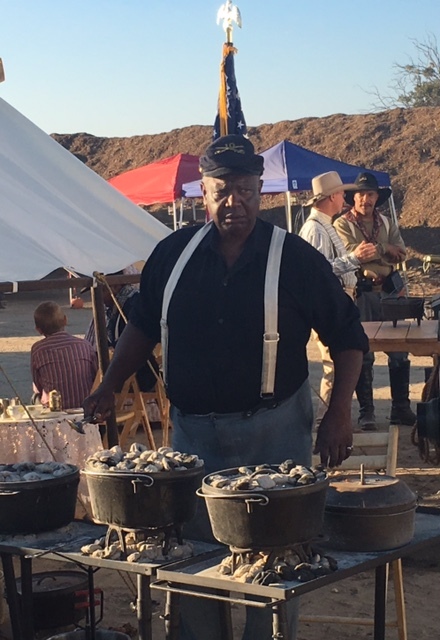 Currently, when BSMCU is out on weekend campaigns or in a remote "Old West" town, from the chuckwagon meals are prepared in Dutch ovens and a typical dinner consist of Apache beef, macaroni n cheese, tossed green salad, skillet potatoes and peach cobbler. Note: A farm wagon has many metal pieces which allows it to function. To begin construction there was a need to obtain another wagon and remove the metal pieces. 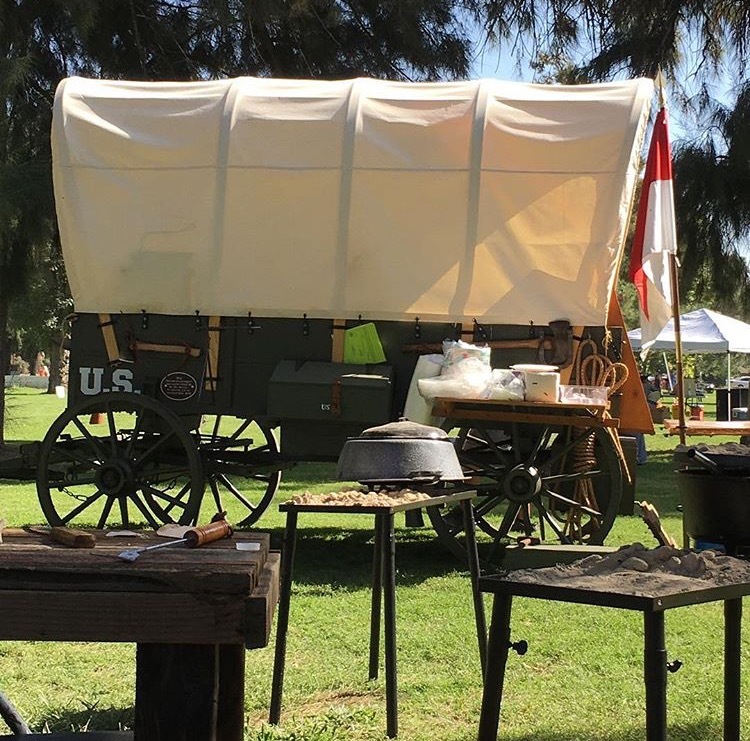 BSMCU utilized social media and located a family in Porterville, CA who had an old wagon on their ranch. The wagon was given to BSMCU and the metal pieces harvested, reclaimed and now adorned on the BSMCU chuckwagon. BSMCU is eternally grateful to the Gibson family for their generous gift. 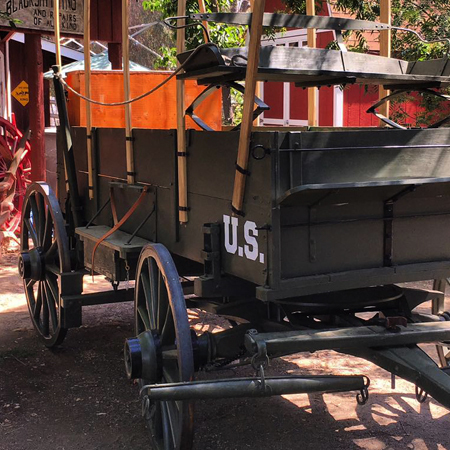 The 1865 “Deluxe Chuckwagon” is a replica of a US Army wagon. The M1865 was purchased for $5.00 dollars at a government surplus auction. The wagon had no wheels, and the front and rear hounds had to be rebuilt. The “box” (chuckbox) was a custom design and Army experiment, built by former carpenters, now “Troopers” assigned to the 10th Cavalry (Buffalo Soldiers). Troop H, 10th Cavalry, were on campaign in the Amarillo, Texas area when they came across Charles Goodnight, a wealthy Texas rancher. Goodnight took an interest in the custom “box” and said his carpenters can build a better box. A few years later Charles Goodnight was credited with building the first “Chuckwagon.” Troop H, 10th Cavalry continued operations in Amarillo and went on to become American heroes. This story came out of the old west and over time has changed more than once. The truth has been lost to history. Nothing compares to the smell and taste of foods being cooked under a blue sky in a Dutch oven over a hickory wood fire. Dutch ovens were used by European Americans as they travelled across the Western frontier. Over the years Dutch ovens took on an intrinsic value. They were used and kept over a lifetime and passed down generation to generation. Everyone knew the magic that Dutch ovens created. Dutch ovens perform under all conditions; hot/cold, as long as there is a fire and food to cook, you can enjoy a great meal. BSMCU chefs realize the value of Dutch ovens and use them exclusively to cook. Our chefs are not classically trained in the culinary sciences, but are self-taught, trained magicians who can produce meals to calm the body and spirit. They have over 90 years of combined cooking experience that involves outdoor camping, family cooking, and Dutch oven cooking. These skills and talents are brought to bear on each event that is looked upon as another opportunity to excel and make the eating experience and event exceptional. It is this commitment found only here in the Central Valley. Let BSMCU entertain, educate, and provide a delicious and satisfying meal for you and your family. Having a chuckwagon and its representation of the Western frontier and a bygone era, promotes interest and fascination. It attracts the attention of the young and young at heart. People want to know “Does it work?” What kind of wood is it? Is it a real wagon? It is the intention of BSMCU to partner with local grocery stores to provide free meals and outreach to those who are hungry, looking for education, fellowship, or information related to social services. 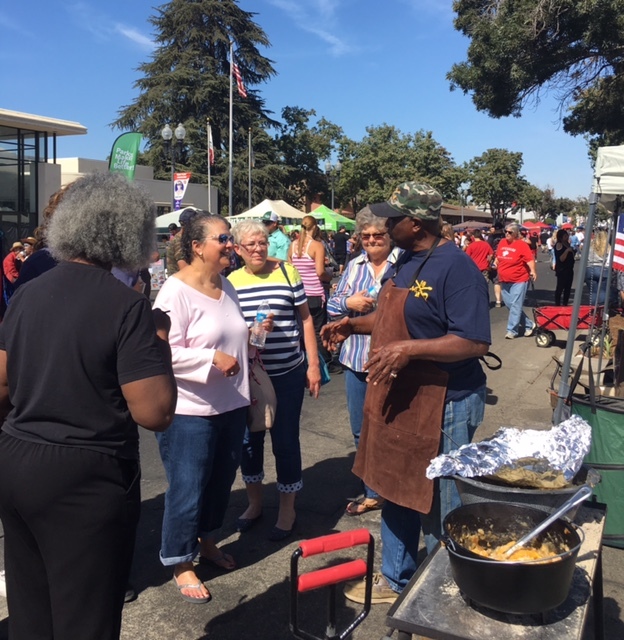 The chuckwagon then becomes an effective humanitarian tool for social outreach. BSMCU accidentally discovered from participation in food truck festivals and smaller civic events where food is served, chuckwagon food offers an opportunity to raise funds in addition to sharing the Buffalo Soldier story and educating the public on how Army wagons were utilized during and after the Civil War and Frontier Wars.